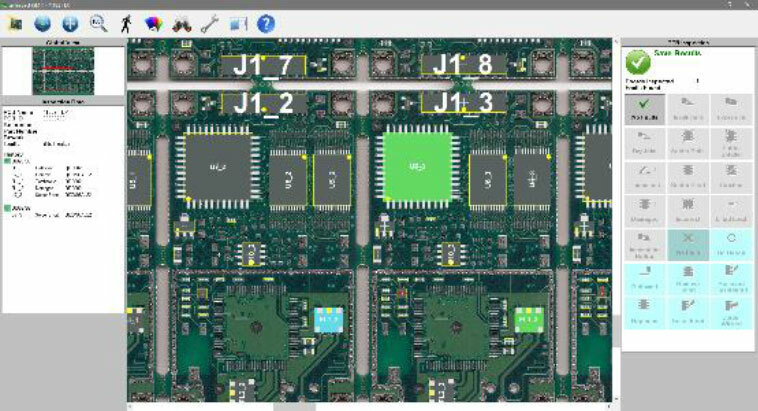 A picture of the inspection PCB is drawn allowing the user to select an inspection fault and repair action for each Reference on the PCB. All data collected is saved to an XML database system for future reference. Inspection Mode. Faults found are recorded and saved by PCB name or Unique ID. Repair Mode. 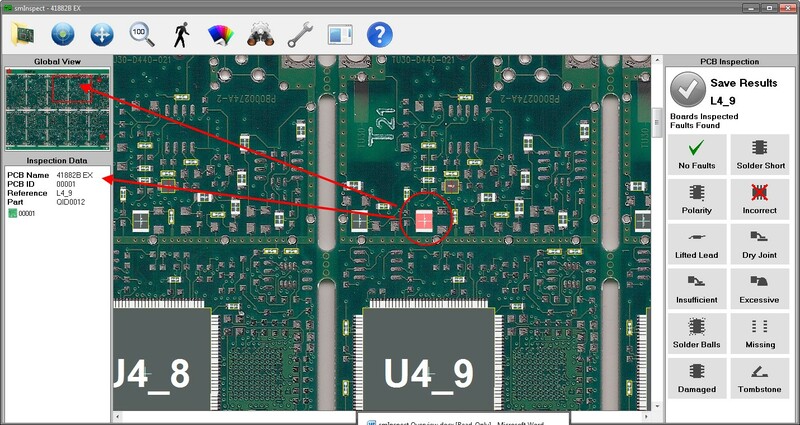 Faults found in inspection are repaired, PCB’s are identified by Unique ID. smInspect can be run with both modes selected. This shows the main entry screen. The system is designed for a touch screen application or by using standard mouse selection. Full touch screen functionality is provided. Large buttons and tap options allow the system to operate in an environment where a keyboard and mouse would be difficult. 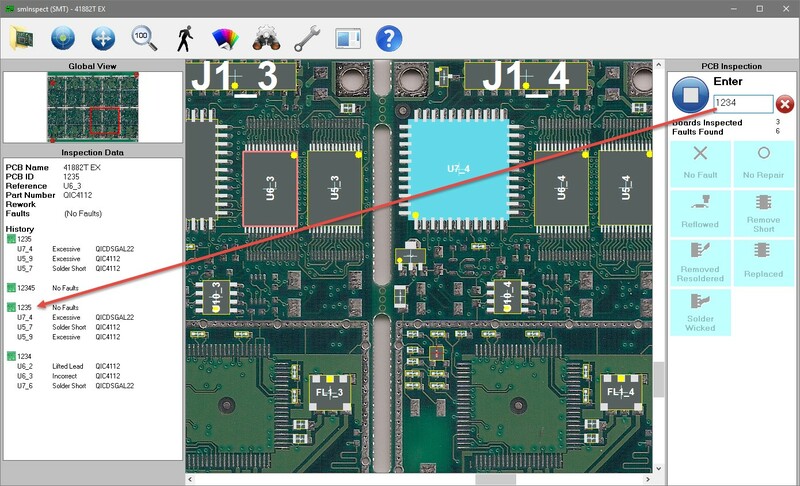 A picture of the PCB is generated from the SMT Placement machine file, or SMT Job file. The user selects the part that the fault is found on and then records the fault found. A No Faults button is provided when the PCB has no faults to record. When the inspection is finished “Save PCB Results” is selected. 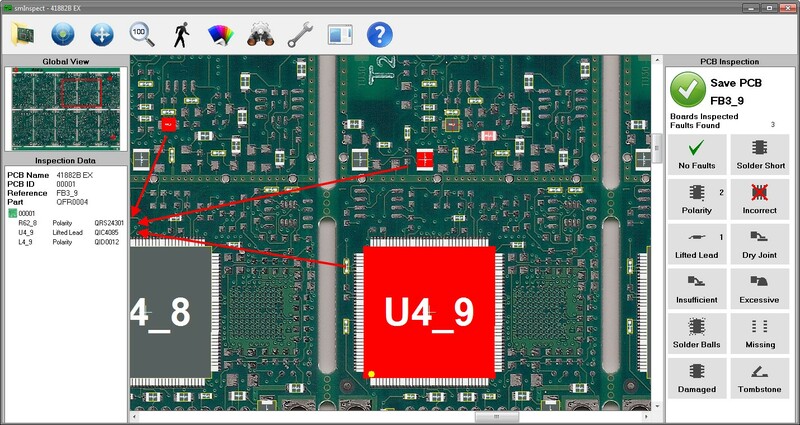 A previously inspected PCB uniquie ID is scanned in. smInspect will immdiately make sure the correct SMT Program is loaded. Previously inspected parts are colored Blue. Select these parts and click the repear category. The repaired part will now be colored green. From the inspection has window you are able to record new data and view summary results. 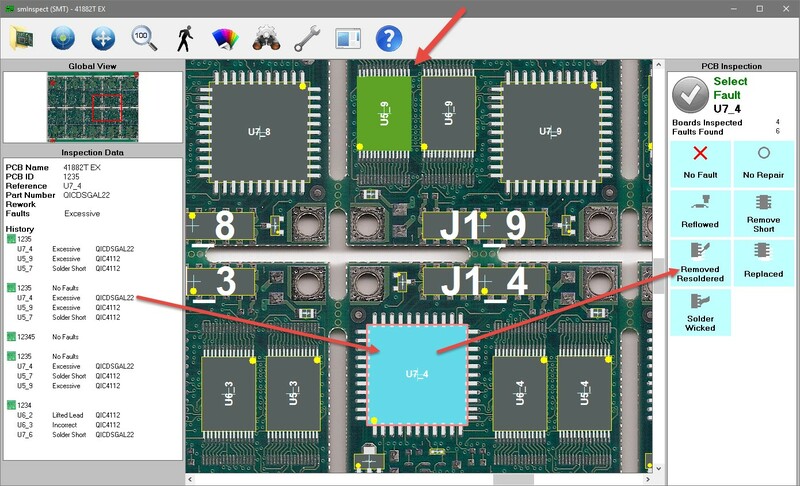 When the PCB is fully inspected the results are saved for the PCB. 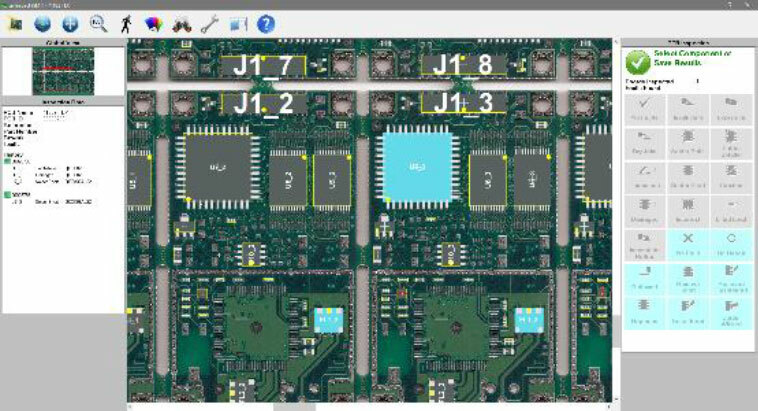 As PCB’s pass through smInspect the system keeps a running total of boards inspected, components used defects found and other performance yield data. 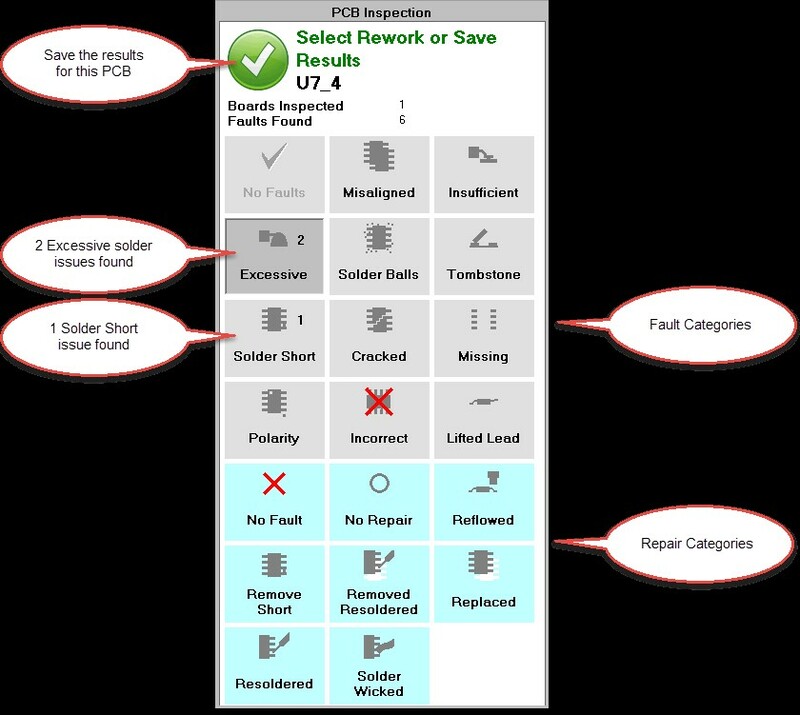 If there are no faults then select the no faults button and then Save PCB. This saves the good board information so we can chart yield in Linechart. Fault data can be displayed using the SMS Linechart Viewer that comes with smInspect. Linechart Viewer is fully functional it is the same system used for AOI and SMT Machine performance. 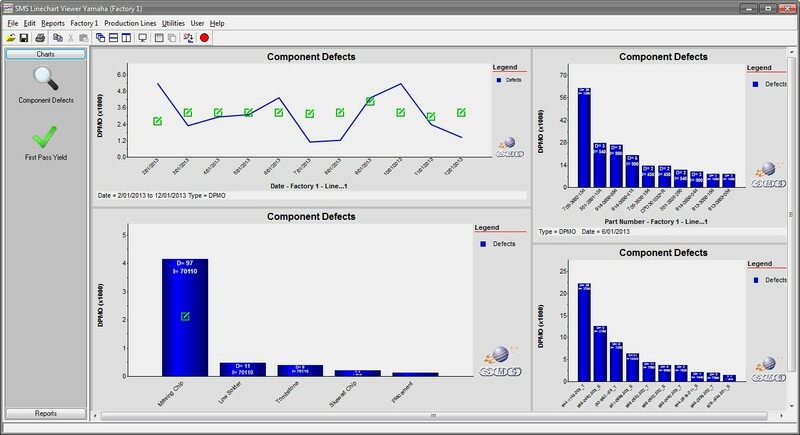 Chart type available for smInspect include “Component Defects” and “First Pass Yield” with display options DPMO, Percentage and Count. The data has full drill down functionality, so you can see what the overall quality is, but also be able to drill all the way down to specific references. The data can be displayed as a chart or displayed as an exportable report. The reports can be viewed and saved as Text or CSV and viewed directly for example in Excel.